Bishkek, Kyrgyzstan is freezing cold during the long winter months. No one knows this better than the people with out a home. Homelessness in Bishkek, the capital city of Kyrgyzstan, is rampant. Volunteers help to pull a homeless couple, Natasha and Artur, out from the manhole that they had been living in. Natasha suffered from severe frostbite on her feet and needed to be taken to a hospital. 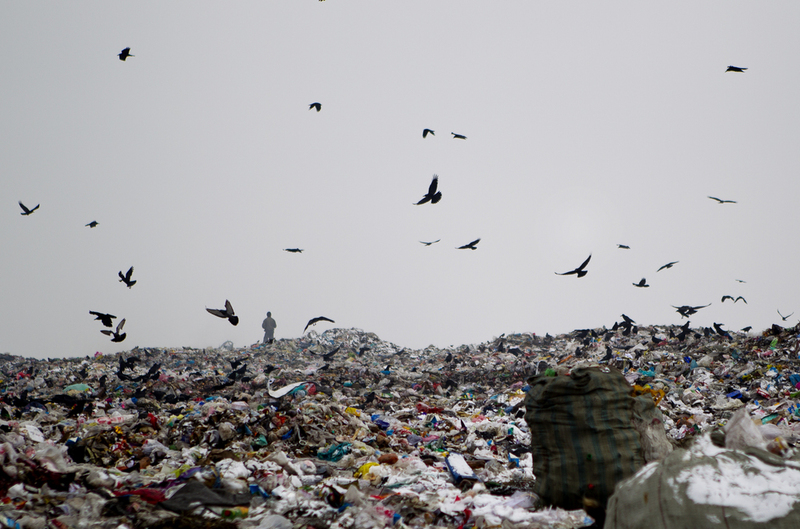 A homeless man stands in the distance at a large landfill outside of Bishkek. Many homeless people pick through trash at the landfill, or from dumpsters in town, and some even live at the landfill. After the collapse of the Soviet Union, homelessness became a major issue for the city. People left their homes in rural areas and moved to the city in search of jobs. When they arrived in Bishkek, many discovered that there weren't enough jobs to go around and ended up on the streets. Ayana stands outside the shed that she and three other homeless people live in. She said that the bruises on her face come from cops that beat her and the other homeless people. Elena Andreava begs for money on the steps of a Bishkek shopping center. Tatiana Gerasimova, a blind homeless woman, at the Kolotomto shelter in Bishkek. The Kolotomto shelter is one of the few places that the homeless can go for help in Bishkek. Natasha cries as Artur and a nurse wash and shave her at Bishkek Hospital Number Four. The constant below-freezing temperatures in winter make being homeless deadly. People often live in the sewer system in attempt to stay warm, but after awhile many end up jammed in overcrowded public hospitals because of frostbite, or burns from passing out on the hot sewer pipes or camp fires. Amputation of the toes, feet and fingertips because of frostbite is a common occurrence. A homeless man rides in an ambulance to Bishkek Hospital Number 4 for frostbite treatment. Iman Jeenbaev has a head wound cleaned by a volunteer at Fountain of Light, an NGO that provides help to homeless people in Bishkek. He was beaten with a crow bar after a drunken night on the streets. Ana Chirnova sits on a bed at Bishkek Hospital Number Four. She recently had to have all of her toes amputated because of frostbite. Chirnova had been living on the streets for two years. A pair of shoes left behind at a homeless gathering spot in Bishkek. 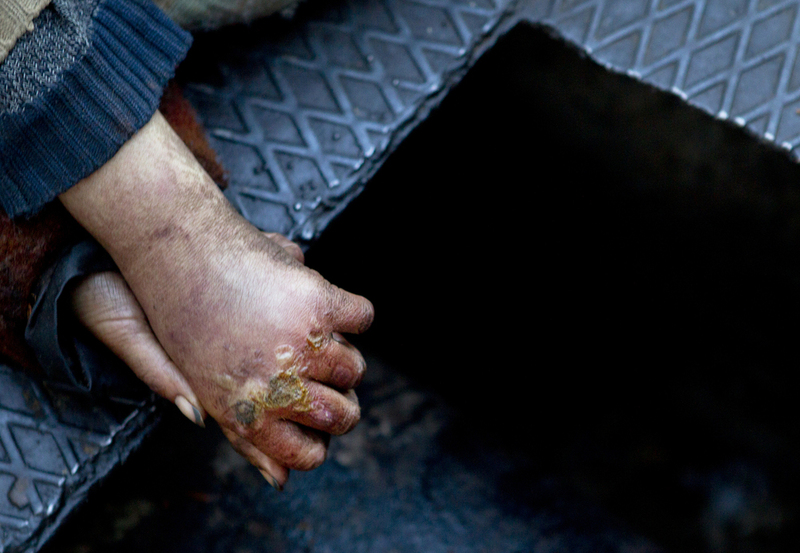 Alexander Vladimirovich lays on his bed in the overcrowded homeless room at Bishkek Hospital Number Four.